Posted by snoozerider in autumn, kids craft. Waif’s enthusiasm for furnishing the autumn table knows no bounds! He has coloured in a beautiful little “My Autumn Book” printed from the Crayola website (coloured so neatly, I accused his Dad of having coloured it!) 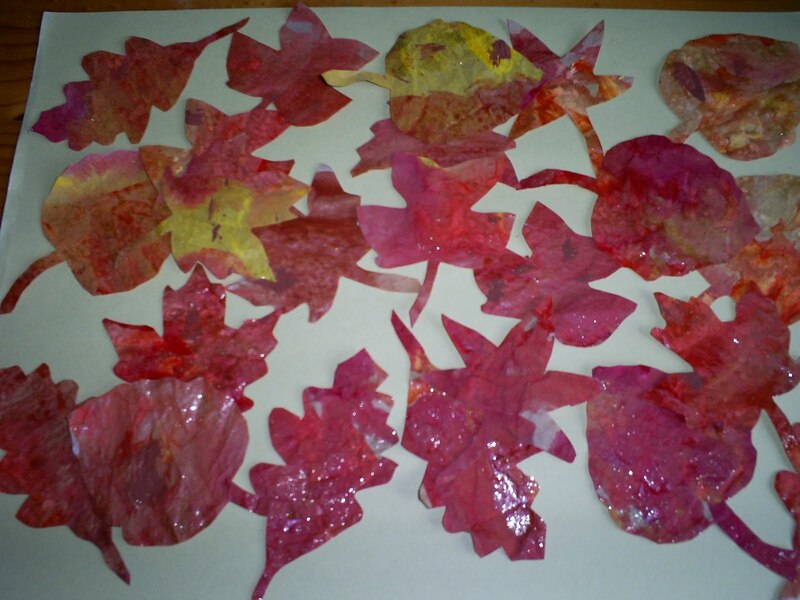 and we had a go at making paper bag autumn leaves from this tutorial. Both boys enjoyed splodging the paint onto the flattened paper bag, but also particularly enjoyed swirling the paint colours together, which is how ours have ended up with considerably more red in the mix than Creative Kismet’s! As predicted, the boys did lose some enthusiasm when it came to painstakingly cutting autumn leaf shapes out of the ensuing pretty coloured bag so that was left to Mummy ;-). Rather than make a garland, Waif has stuck our leaves all around the fireplace and they look rather nice, although he has presented them rather more uniformly than I might have liked (all of one shape on the left side, another shape at the top, other shape on the right!) Where did he get such an orderly mind? !